Nanoemulsions – High intensity sonication will create translucent nanoemulsions which can be used to accurately infuse cannabinoids (i.e. CBD & THC) into beverages and edibles. Oil/Water Cannabis Emulsions – Cannabinoids are soluble in oil and fats but not water. In order to overcome the immiscibility of cannabinoids in water, a proper method of emulsification is needed. Sonication is a widely used technology in the pharmaceutical industry and helps to produce nano-size, stable emulsions. Ultrasonic energy ensures active compounds, such as Cannabinoids, are evenly mixed throughout liquids. This allows users to create edibles and beverages with even dosing of active compounds throughout the product. To assist the absorption of the active substances of cannabis into the digestive system vegetable oils (i.e. coconut or olive) can be used. For optimal absorption, cannabis extracts are mixed into oil and then further processed into an emulsion. For cannabis oil emulsions, lecithin is a common emulsifier. A liposome is a hollow spherical nano-structure inside of a cell that has a membrane made up of a Phospholipid bilayer (see photo*). Liposomes work with the phosopholipids in the semi-permeable membrane of our body’s cells to transport nutrients into the cell. Liposomes are also used as a protective vehicle for the transfer of pharmaceuticals throughout the bloodstream. Liposomes can be created artificially by sonication to encapsulate active compounds (such as CBD, THC, etc.) and is a very effective method of pharmaceutical delivery. When ingested, the pharmacokinetic properties of liposome intestinal absorption override the usual absorption pattern of the encapsulated compound. For example, the delivery of a supplement with a typically slow or regulated pattern of absorption, such as vitamin C, may be accelerated when encapsulated within a liposome. These vesicles can encapsulate both water soluble (hydrophilic) substances in their hollow aqueous centers, as well as fat soluble (hydrophobic) nutrients within the lipid bilayer membranes. Creating Textured Cannabinoid Products – The Babylon Company has detailed an easier way to make cannabinoid products by using Qsonica Sonicators. Dry plant material (50/50 flower to sugar trim ratio) was extracted using research grade n-butane. The extracted material was then purged as Shatter in a vacuum oven to ensure low residual ppm (under 10ppm) for consumption in the recreational market in the State of Alaska. Qsonica Sonicators were then used to create a nanoemulsified final product. The lab report of the resulting product is attached along with the complete methodologies. Liquid solution cannabinoid products (e.g. Hash Oil) for the filling of vape cartridges/tanks. Amorphous Textured Cannabinoids (e.g. Wax, Crumble, Cake Batter, etc). Vessel Shape and Size - A narrow vessel is preferable to a wide vessel. The ultrasonic energy is generated from the tip and is directed downward. 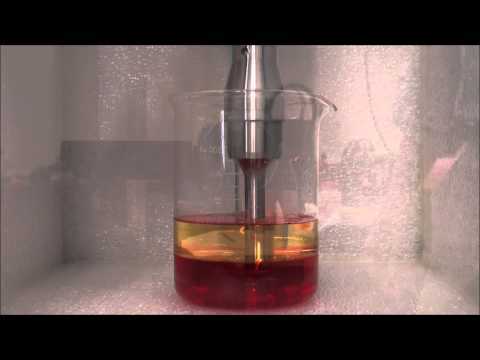 As a sample is processed the liquid is pushed down and away in all directions. If the vessel is too wide it will not mix effectively and some sample will remain untreated at the periphery. Twice the volume in a narrow vessel takes a shorter time to process than the same volume in a wider vessel. In addition, the probe should never touch the sides or bottom of a vessel. Visit the FAQ section for answers to more questions about sonication.